In Japan, members of a Yakuza family is just that: family. The godfather of the organization is more than just a boss, he's a surrogate father, and the soldiers who serve under him are his sons. Brothers. 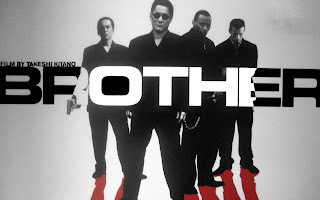 In America, the word "brother" carries a more casual weight, in that it's simply a term any black man can call another black man, even though they've only just met. This is the basis of Takeshi Kitano's international mafia epic, whose lessons in family relations will change who you call your brother, forever.